It’s no secret that Chris and I are in a hectic season of our lives. Finding a place to live in a city you don’t know is all sorts of frustrating, especially when every place you like seems to get rented the next day. I would be lying to y’all if I didn’t say we have been feeling discouraged. It is easy to dwell on the negative, but Chris and I are also so thankful for this opportunity. Medical school was a long journey, and it is a huge relief to move on to the next step. Chris is headed to a fantastic program that will provide a great foundation for him before radiology residency. I am excited to explore a new city with my love…and to come home a short year later! 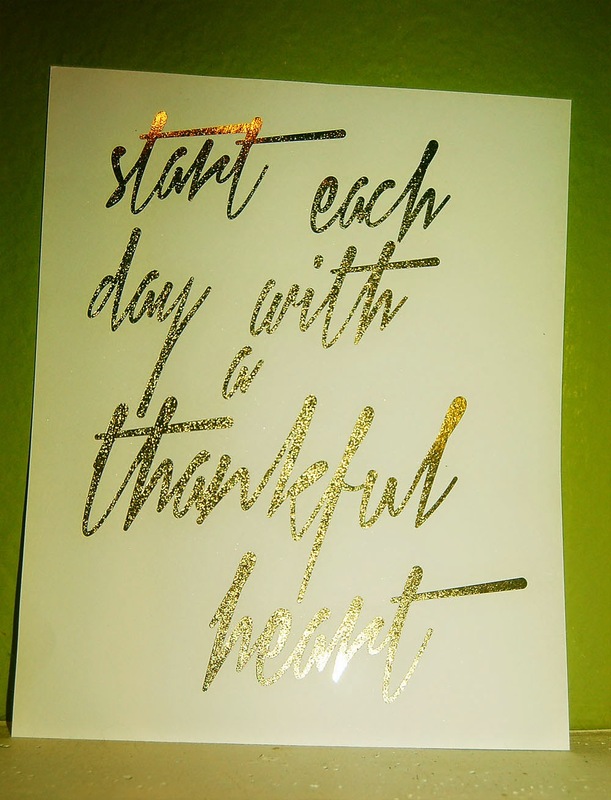 Claire from The Studio by Fashion + Feathers sent me a beautiful gold foil print with a message I am trying to remember daily: “Start each day with a thankful heart.” I can’t tell y’all how much a difference it makes in my day when I wake up with a thankful heart and remind myself of the many blessings in my life. I can’t wait to hang it in our new Chicago bedroom! Not only does Claire’s shop feature several beautiful gold inspirational prints, she also designed a fun phone case and a great T-shirt! Claire and I started blogging around the same time, and I have really enjoyed getting to know her. When she told me she opened a shop, I was so impressed with the lovely items she created. One of my favorite things about blogging is supporting each other, and I can’t wait to watch Claire’s shop grow! Claire also kindly provided a code for my readers. Use THESIBERIANAMERICAN to receive 10 percent off your purchase, good for the next week. I received the gold foil print courtesy of The Studio at Fashion + Feathers, but all opinions are my own. that print is so cute!! You guys will find the perfect place for you, I know it. And I love that print! I'm definitely checking out her shop. Moving is tough never mind moving out of state. I hope you find something perfect for you two soon. That quote is perfect. I try to remember to be thankful more often too. It definitely helps my outlook. You're moving to Chicago! How fun is that!! It's definitely frustrating to look for housing when you're still out of state, but you guys will find something. Good luck with the big move! That print is lovely, and remembering gratitude is definitely a good way to start each day. I'm in the middle of looking for a new place to live too. No, it's not out of state, but it's frustrating as well because things are leased so fast. And, inspection times are scheduled during the work day. I work about an hour from where I live, so inspections aren't exactly easy to attend. I feel ya. We will both find something, right?!?! Ah, yes! I am totally with you right now! I love that quote and the print is gorgeous! Hey girl. Just wanted to let you know that I have been thinking about you and the turmoil that you must be experiencing with this big change. I'm behind on my own writing these days, but know that I am thinking about you and look forward to following your journey.